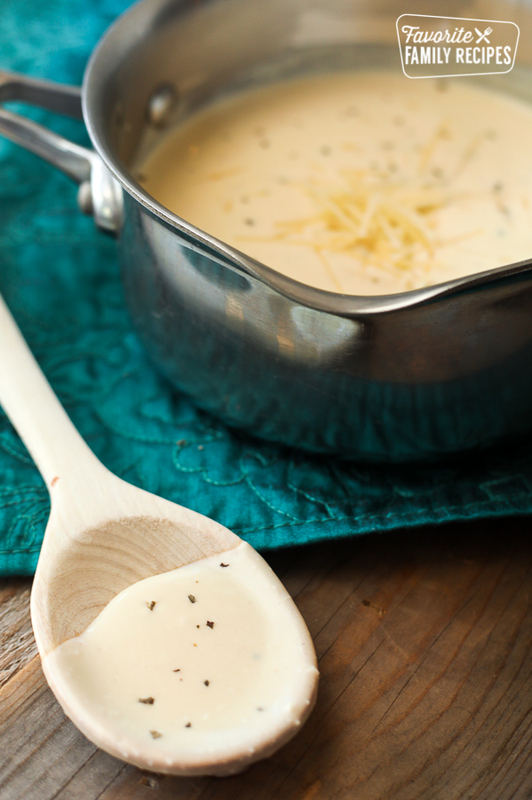 Our Homemade Alfredo Sauce recipe is rich, creamy and so cheesy. It tastes better than any restaurant variety and is totally easy to make! Back in his dating days, my brother wanted to impress his date by making her a fancy pasta dinner. He called me up (I was 14 or 15 at the time) and said “Erica, I need to impress this girl, Amber. I told her that I am going to make her a nice dinner tonight.” Of course I knew that he REALLY meant: “Erica, you are going to make a nice dinner for both of us tonight and I will pay for the grocery bill.” Later that evening when the table was set with candles and fine dinnerware, the pasta was al dente, the sauce was simmering, and all the sides were ready to serve, the doorbell rang. I was ushered into the basement and there I sat the rest of the night while Devin and Amber enjoyed their candle-light dinner upstairs. A Homemade Alfredo Sauce Success! Amber was so impressed by the dinner that “Devin” made, she later consented to be his wife. Years later, she realized the truth when she asked my sweet brother to make her his “famous” Alfredo sauce. He called upon me, his loving sister to bail him out again. 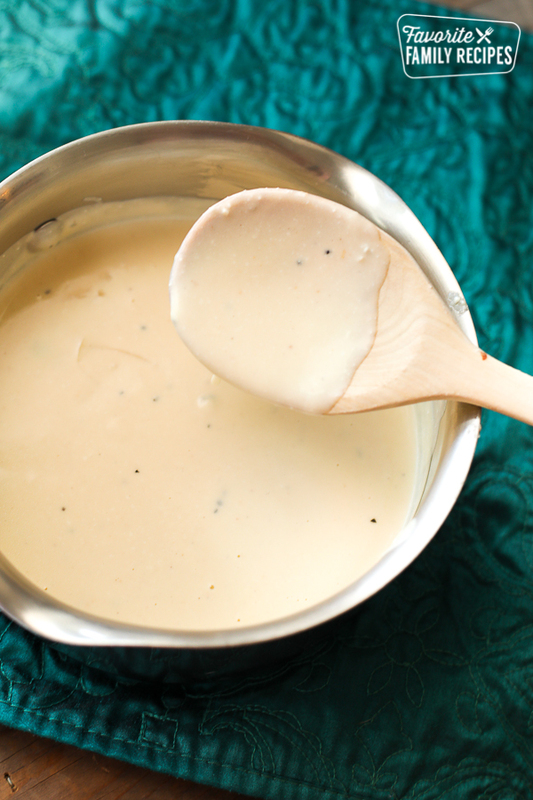 So for all you Devins out there, here’s my foolproof (and matchmaking) Homemade Alfredo Sauce. This is actually the very first recipe I created that I can truly call my own. But I’m happy to share it with my brother, and with all of you. What Ingredients Do I Need to Make this Homemade Alfredo Sauce Recipe? Most Alfredo sauce recipes call for heavy cream, or unusual, hard to find ingredients. Not for this easy homemade recipe! All you need are a few kitchen staple items like sour cream, fresh Parmesan cheese, garlic powder and cream cheese. 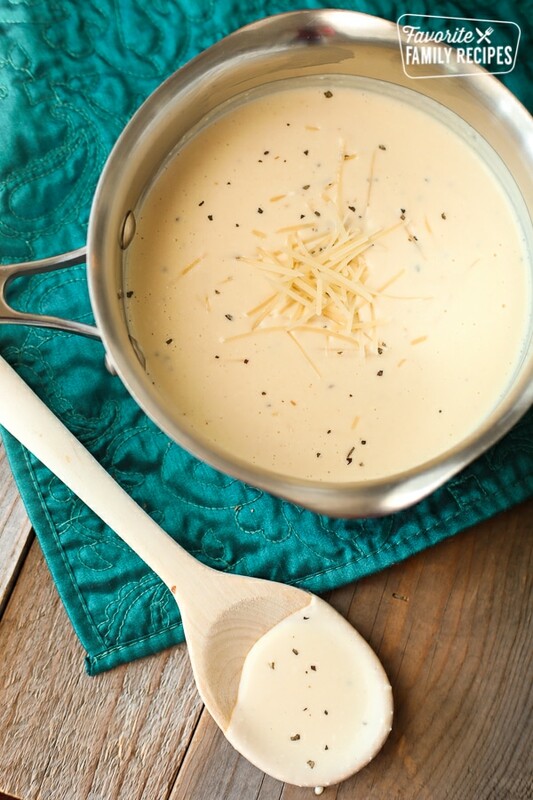 The result is a rich, creamy sauce with a tangy bite of Parmesan cheese. You’ll never miss the heavy cream, I promise! Of course this glorious sauce is perfect with Fettuccine or Linguini noodles, but it also makes the most decadent dip for our favorite bread twists or veggies. It’s also delicious drizzled over chicken, or slathered over pizza crust. (Try our family’s favorite pizza dough recipe for your next pizza night.) The sky’s the limit on how you want to eat this stuff. And nobody will judge you if it’s just you, a bowl of sauce and a spoon. Melt the butter in a medium-sized saucepan over medium heat. Add cream cheese, sour cream and and garlic powder, stirring with a wire whisk until smooth. Add milk a little at a time while, continue to whisk. Stir in Parmesan cheese and salt & pepper. Remove from heat when it gets to the desired consistency. Sauce will thicken rapidly, thin with milk if needed. Serve over fettuccine or linguini noodles and garnish with fresh parsley. this was an excellent sauce. We loved it…….! Just made it…so delicious. I used it with a gluten free pasta for my husband. Thanks for sharing! Should b.. This is the exact recipe for copycat olive garden alfredo sauce my sister gave me 10 yrs ago lol. Do we have to use garlic powder or can we use regular garlic? It won’t thicken as well without the cream cheese, it will be quite runny and won’t taste as creamy. Hope this helps! Wow! Thank you so much for sharing this information with us. What a gift your grandfather gave to the world. Our family LOVES Fettuccine Alfredo! So cool!! I loveeee Alfredo. Thank you to your grandfather!